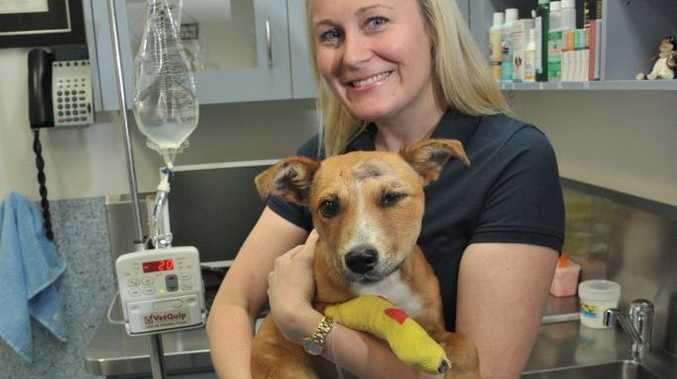 LUCKY, the injured staffie cross kelpie, is living up to his new name. First he escaped the jaws of a vicious rottweiler, and now his rescuers want to adopt him. Matt and Marissa Collum said they had fallen in love with the vulnerable pooch after he was mauled at Wurtulla beach on Saturday. Together with another couple, they prised the 18-week-old pup from the rottweiler's jaws and rushed him to Nicklin Way Vet Surgery. Mr Collum said they had spent almost every day with Lucky since. "We just fell in love with him and we want him to have a good home, where he will be loved," Mr Collum said. "He would bring so much joy to our lives and we would give him all the affection he deserves." Veterinarian Melanie Irvine said Lucky's owner had until tomorrow afternoon to claim him. "We want him to go to a good home and to someone who is going to care for him, and we think that Matt and Marissa would do a great job," Ms Irvine said. "He is a little timid around other dogs now, but he is very affectionate and would be a great pet." Lucky has gained one kilo since being rescued and most of his facial injuries have healed. Sunshine Coast Council has appealed for any information that might identify the owner of the rottweiler. Mr Collum said he would make a donation to 4 Paws Animal Refuge.